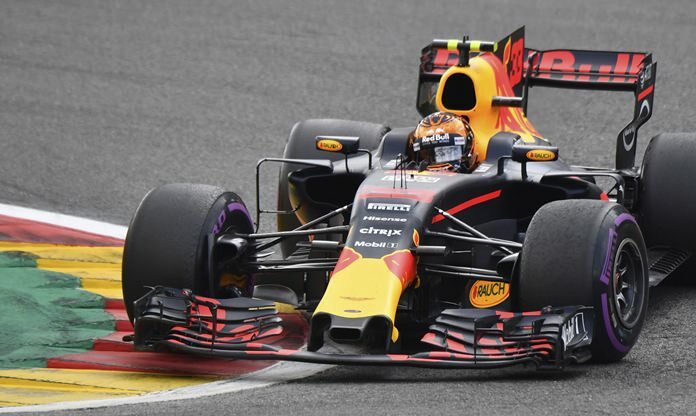 Spa-Francorchamps, Belgium (AP) — The paradox at Red Bull is baffling: Daniel Ricciardo keeps getting on the podium while teammate Max Verstappen can hardly finish a race. Verstappen’s early retirement from Sunday’s Belgian Grand Prix was the sixth time he failed to finish a Formula One race this season. Ricciardo’s third place was his sixth podium so far. Since finishing third in China at the second race of the season, Verstappen has failed to finish six of the past 10 races. He already counts twice as many DNFs — failures to complete a race — as last season, with eight GPs remaining. When Verstappen made the switch from Toro Rosso to Red Bull in the fifth race of last season, he secured a brilliant win on his team debut at the Spanish GP. He went on to secure six more podiums in a brilliant breakthrough season that earmarked him as a future — and potentially multiple — world champion. With another year left on his Red Bull contract, the 19-year-old Dutchman will hope for far better fortunes in 2018. There will be plenty of offers elsewhere if he grows tired of an increasingly frustrating situation. Verstappen was so exasperated after his latest setback that he sarcastically compared his car to Fernando Alonso’s malfunctioning McLaren in terms of reliability — or lack of. Alonso has finished only three races as McLaren still struggles badly with its Honda engines. The Italian GP is this weekend, and Verstappen could be hit with grid penalties if the team has to make some more engine changes. Red Bull uses Renault as its engine supplier, and although the relationship has improved somewhat, it remains a tense one. Team Principal Christian Horner pointed the finger at Renault after Verstappen’s latest incident. Horner has been openly critical of Renault in the past, and appears to be running out of patience once again. But the curious thing is that Ricciardo, with the same supposedly treacherous engine, is in fine form. This raises the question as to whether Verstappen’s aggressive, full-on driving style may be less suited to the car than his Australian teammate’s more patient approach.